OK … this is the capsule where I play the Dissenting Fool, giving a “mixed” grade to the film voted the Best of the Fest in the IndieWire critics poll and that Scott Tobias (in whose Tweet-presence I blasphemed) has apparently called the favorite of his entire life as a working critic. I don’t hate MEEK’S CUTOFF, a sorta-Western “lost on the Oregon Trail” drama, like I hated GERRY, to which Mike D’Angelo compared it. Indeed, if it had come up with an ending at all, it was a shoo-in “7” and possibly higher, depending on how that ending came off. But that’s not what we have. Instead we have a film that ostentatiously refuses to end, instead settling on a sub-Malick nature-awe note of ambiguous something or other. Saying why I hated the ending will necessitate describing it. YOU HAVE BEEN WARNED. However I can’t just ignore what’s good about MEEK’S CROSSING –- and it is for a long time. First of all, it’s dazzling to look at, almost feeling like a black-and-white film with its blanched images of a parched, water-free land with few primary colors (the costumes match too of course). This is a desert/steppe environment, but it’s nothing like the sumptuousness amid the dryness in LAWRENCE OF ARABIA or THE SHELTERING SKY, and when she cuts from a night scene to a dazzling white steppe, I had to restrain myself from applauding. MEEK’S CROSSING also creates a strong sense of place, far stronger than most classical Westerns -– what these people routinely did and how they did them, feeling almost like a 19th-century procedural. Near the end in that vein, there is a (Skandie plug) great scene of the families trying to get several wagons down a slope they fear might be too steep, and there’s a universe of dreams and lives riding on the tug-of-war apparatus the settlers build. Reichardt also favors long shots and closeups of elements other than the face – hands doing stitching, for example – and thus creates more of a community than a group of individuals (think STAGECOACH). This is obviously fine; given this story, they will live or die together. But it proves fatal when she later wants to get into character conflict – she hasn’t set up THAT kind of third act. The classic test of a film or play or novel is: look at the first scene, look at the last scene, what has changed. The answer to that question is what the film is about. And here, I have to submit that MEEK’S CUTOFF is therefore about nothing. For the entire movie, the wagoneers have been lost and desperate for water. At the end? They are still lost (that’s even one of the last lines of dialog – “we’re right where we always were”) and are looking at a leafy tree, which, yes, does imply that there’s water nearby, but … um … where, nearby? Especially since there’s a person on the point of death, to end the story at the tree is the narrative form of being a tease. As for character, the conflict in the back half of MEEK’S CUTOFF centers on a captured American Indian, whom the group has come increasingly to rely upon instead of their paid guide (Bruce Greenwood), thanks to Michelle Williams pulling a gun (this is the character conflict that seems arbitrary once it starts). But they’re following him on faith since he speaks only an Indian language and performs some rites and ceremonies that Reichardt never subtitles or explains – which is fine in itself, because the settlers don’t either and so they haggle continually over “is he trying to help us,” “is he leading us into a trap” or “is he just leading us to nowhere, willing to sacrifice himself.” At the end, at the tree, some of the last lines of dialog are “we’re all following him now” and “we’re all just playing our parts” and “this was written long before we got here.” Meanwhile, the Indian himself walks away unmolested (why is he able to do so now but not before). If MEEK’S CUTOFF is about the transference of authority from Meek to the Indian (plausible enough), why, in story terms, should he walk off? And even of those thematic grounds, whether he was/is a good or a bad authority is not a question you can slough off. If Reichardt’s narrative was a tease, her thematic choices were the equivalent of then walking away. Now here, on the other hand, is a three-hour essay movie that so bursts with ideas and thoughts and points that I wouldn’t even want it to be 90 or 100 minutes because it already feels that short. Apart from my irrational discomfort at never having disliked a Romanian movie and some minorly-weird subtitling from someone whose English is a little “off,” my only reservation is that Ujica is maybe a bit too rigorous with his premise – showing nothing but official newsreels, speeches, parliament footage and TV broadcasts with no commentary, thus building Ceausescu’s life story as he himself would have seen it (the title says “autobiography” not “biography”). As a result, people without some pre-existing knowledge of East European politics and history might find AUTOBIOGRAPHY a bit hard to follow -– at least give us a date card or two or identifying namelines like news-anchor chyrons, Andrei. I don’t think Alexander Dubcek is the kind of instant-face that Gorbachev, Nixon, the Queen or Mao are. Which would be a shame, because this film pulls off the hard task of both being believable as a self-portrait and utterly damning from within. Since you’re watching footage, you have to construct the meaning yourself, but Ujica’s choices make it easy enough. Two threads in particular seem fruitful to follow – the presence of Elena Ceausescu and the personal hagiography of Nicolae himself, both being measures of how Ceausescu changed over his 25 years in power, from a non-descript general secretary to the out-of-touch head of an insane personality cult and a self-justifying Potemkin state. At the start, Ceausescu is even a semi-attractive figure, hosting Dubcek for a public solidarity rally and then later denouncing the Soviet invasion of Czechoslovakia in as public a forum and as blunt a manner as possible. After that, Ceausescu becomes a regular caller and host for the world’s biggest political figures. The film’s length helps here, because it lets us get a LOT of world leaders praising Ceausescu and, well, you can come to believe it. The film suggests he gets the ideas for the personality cult from visits to China and North Korea (the first trip to Pyongyang is a commie-kitsch hoot and has Ceausescu whispering to Kim Il Sung “that was wonderful”; and it’s also easily the best-looking color footage in the film, which says something about Romanian technology at the time). After seeing Mao’s and Kim’s displays for his benefit, his portraits at home become more publicly prominent, the celebrations of his birthday more lavish and obsequious on others’ part, and the sloganeering more personal (“Long Live Ceausescu” and “Ceausescu and the people,” say, rather than “Long Live Socialism and Communism”; “Traiasca” is Romanian for “Long Live,” BTW … something the film gives you plenty of chances to learn) As for the Missus, she’s hardly seen early on, but by the end she’s at her husband’s right hand during parliament speeches; not merely a member of the Politburo, but having the other members pass in line to kiss her ring; and even co-signing state laws. And Ujica does it all without cheaply ironic Michael Moore insta-juxtapositions – you have to remember and connect. At one point, when Ceausescu is calling world poverty intolerable and Third World debt relief a moral imperative, I wrote in my notes “don’t cut to some luxury scene [of Ceausescu’s personal life] That’s already been established.” And Ujica, bless his heart, didn’t. You know what my favorite scene in this film was: The very first. It’s just a black water buffalo at night in the Thai jungle, moving around a bit, but somehow, I was immediately enraptured at how sensual the photography was despite the dramatically poor conditions and how the sound design felt lived-in. Much of UNCLE BOONMEE is set at night, and it is simply the most gorgeous night photography I’ve ever seen — clear and dark at the same time, conveying humidity and heat, and both alluring and mysterious, though without expressionistic shadows or obvious “darkness pools” from which something will leap out and go “boo.” And since UNCLE BOONMEE is basically a ghost story, that wouldn’t exactly be an unprecedented move. But Joe doesn’t do “boo,” instead going more for things slowly dissolving in from the background, like camouflage that suddenly betrays itself (the tree of women from near the end of ANTICHRIST, say). With TROPICAL MALADY and SYNDROMES AND A CENTURY, I’ve been on the “Joe is more accessible than his critical champions make him seem” kick. 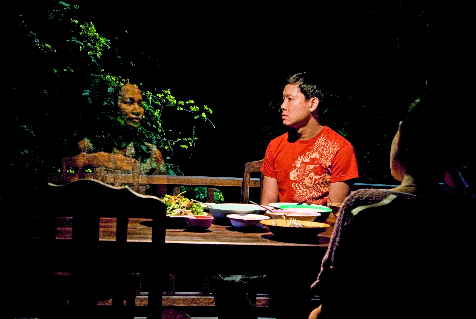 I wouldn’t exactly say UNCLE BOONMEE is difficult and it certainly follows a single through line — basically, the last days of the titular character and the increasing presence of the spirit world coming to claim him. But it is totally “mysterious” from start to finish, though not in a “mystifying” way, if that makes any sense (and I realize that semantically, it doesn’t). This is a semi-mythological world where ghosts appear and the locals take this as normal: there’s a talking catfish seducing a princess, a Bigfoot with glowing red eyes, and eventually a whole army of Bigfoots, etc. But I say “semi” because we still get Joe’s quotidian moments that never fail to feel right, like two people eating honey directly off the hive (only here, one of them is a ghost), and a descent into a cave. And when the catfish … um … churns up the water around the princess, it doesn’t feel at all like the dirty joke it might in lesser hands. I wish I had more to say about UNCLE BOONMEE -– I’m pretty sure there’s some Thai political subtext about “making the ghosts disappear” and Uncle Boonmee’s role in putting down a Communist insurgency –- there’s a series of still photos out of nowhere of Thai soldiers in camouflage outfits that may have something to do with that. But what I hope I’ve conveyed is that UNCLE BOONMEE is a sensual experience, one very hard to describe rationally because it really is like a dream or a trance. 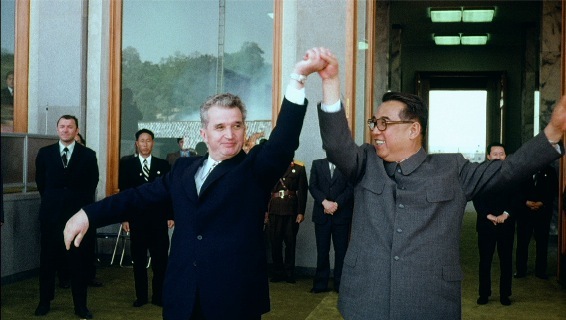 I’ve written twice as much about the Ceausescu film, but that’s only because it’s clear about what it’s about, not because it’s twice as good.